As part of a series of public events to launch the new book Yindyamarra Yambuwan published by Sharing and Learning, a screening of the film, readings and discussion will take place in Wagga City Library in line with NAIDOC week with special guests including Aunty Flo Grant, Dr Uncle Stan Grant Sr AM, Prof Emeritus Stephen Kemmis and Bernard Sullivan. Guest speakers Dr Uncle Stan Grant Sr AM and Bernard Sullivan. This beautiful new full colour book is now available. Yindyamarra Yambuwan, based on the film about the Wiradjuri way of life centred on the concept of Yindyamarra, Yindyamarra is often translated as respect, however, it has multiple meanings including to give honour, go slow, and take responsibility. The book and film describe a field of mutual respect that is the Wiradjuri way of life. 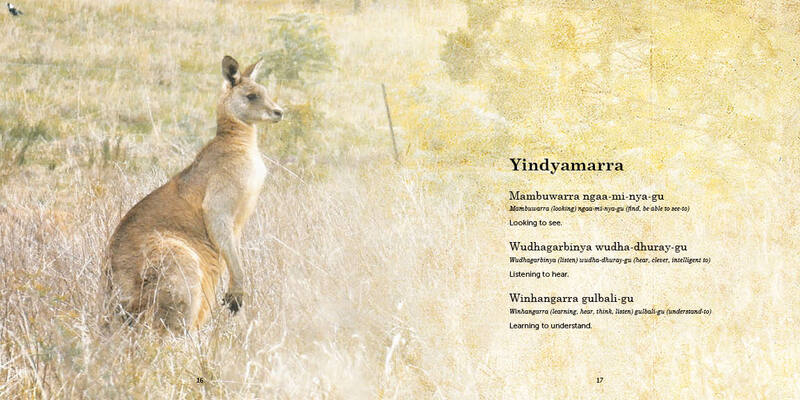 The book contains the poetic text of the film, in Wiradjuri, with both word for word and flowing English translations. Profits go towards the creation of new Language and Cultural revitalisation resources. Living a Yindyamarra way of life cares for country. Both the book and film were developed over a number of years through deep conversations about what is important with Wiradjuri Elders. The book allows a deeper exploration of the unique and beautiful concept of Yindyamarra. It features short essays on Yindyamarra, the importance of language, and how the project was made from Aunty Flo Grant, Dr Uncle Stan Grant Sr and Dr Bernard Sullivan. from the Wiradjuri way of life, land, language and people. longing for yindyamarra to be shown in return. The book is accessible to the general reader, even if they are unfamiliar with Wiradjuri, and is an essential resource for those who wish to go deeper into Wiradjuri language and culture. Yindyamarra, as a way of life, shows the way all who live on Wiradjuri land may be at home here, working together with mutual respect and towards greater understanding. yindyamarra wirimbirra (caring for now) maradhal-gu-bu (for the past and), wirimbirra (caring for now) yandhul-gu-bu (and for the present), wirimbirra (caring for now) giyira-gu-bu (and for the future (womb). Yindyamarra is taking responsibility now for the past, the present and the future. Previous post Do we need protecting? I don’t think so. 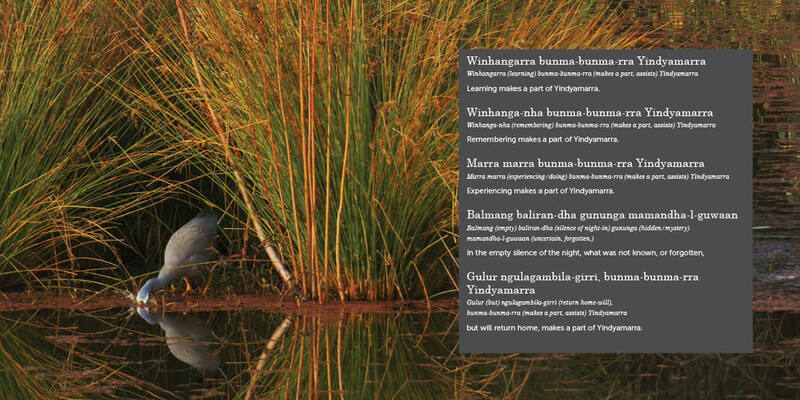 Next post Canberra Book launch – Yindyamarra Yambuwan book now available.